iSHSHIT: What if Google closes Android and goes the Apple model with Motorola? What if Google closes Android and goes the Apple model with Motorola? 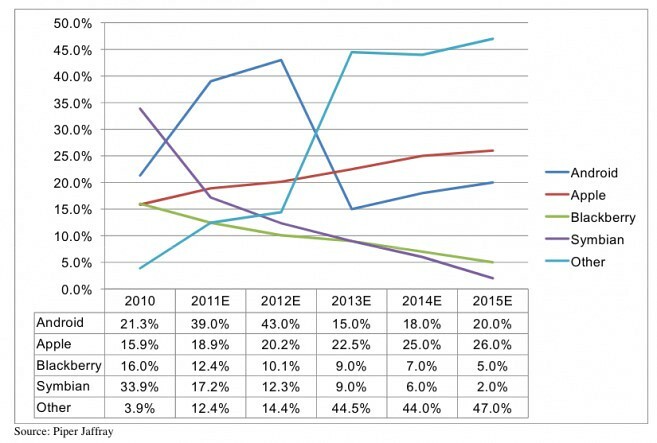 Assuming Android goes proprietary to Motorola, it falls behind Apple in market share by 2012 and Windows Phone (the Other category) gulps up nearly half the mobile phone market. There’s a good reason why Apple’s products “just work”. But it’s been a bumpy road for the Cupertino, California company because right from the onset competitors were ridiculing its vertically integrated approach to business. Apple’s supposedly ‘closed’ ecosystem is a major weakness, critics cry. The past decade, however, saw the marketplace validate the strategy through booming sales of Apple gear. But what if GOOG actually tried the AAPL model with Motorola, which today makes about one in ten Android smartphones? Google loses $4.5 billion in Android ad revenue at $10 per user in 2015 compared to Android’s current trajectory. 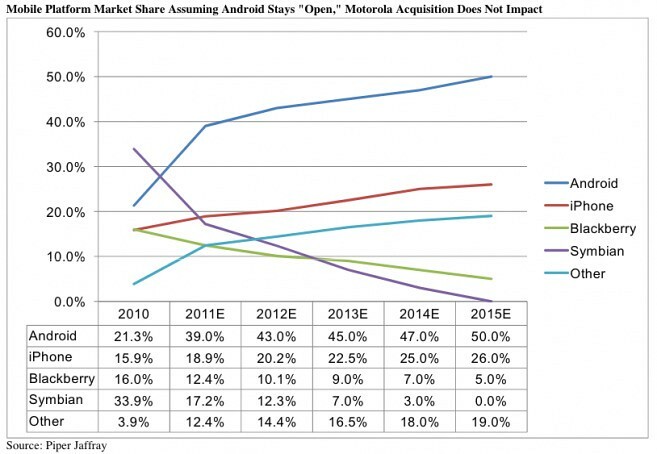 Worse, Android would lose “significant share” being exclusive to Motorola phones, dropping to 15 percent market share in 2013, down from 43 percent. And in the calendar year 2015, Google would sell one in five phones, or 172.5 million units. Primary beneficiary? Microsoft, as betrayed Android backers turn to the Windows Phone software. Should Android remain open, which it likely will, Google and Apple combined grab two-thirds of the market in 2015. Motorola, which has been losing money for far too long, could increase its gross margin to 35 percent (20 percent operating), a material jump over an estimated 25 percent gross margin in the June quarter. Compare that to the iPhone’s 50 percent gross margin (40 percent operating) or an estimated fourteen percent operating margin for Samsung’s mobile unit in the second quarter of this year. Average selling prices of Motorola phones would drop by $50 in 2015 from the $400 in the June quarter of 2011. Contrast that to iPhone which in the June quarter sold for an average selling price of $654, dropping by $137 to 517 in 2015. All in all, while the numbers suggest it could be a very lucrative potential decision for Google to try to replicate the Apple model, we believe it is unlikely Google will go down this path. We believe the most likely outcome is that Google will keep the patents and sell Motorola’s device and set-top box businesses. As a strategic move, we believe buying the entirety of Motorola for its patents was one of the few ways for Google to acquire meaningful IP without being outbid by Apple/Microsoft who have more capital to make aggressive bids to keep patents away from Google. We believe the potential for Apple/Microsoft to bid on Motorola is low given the risk that if Google bows out, Apple/Google would need to deal with breaking up the acquisition or going through with it and owning a business of which it likely wants no part. Furthermore, we believe it is unlikely Google takes Android proprietary because it would significantly impact the share of Android in the market place and cede it to Microsoft, who at this point is not only the only other competitor with a viable mobile OS that is able to be licensed, but the only other competitor that has a competing search engine. The bottom line is that we do not believe Google is willing to potentially weaken its position as the likely leader in mobile search and advertising to try to aggressively monetize Android through an Apple-like model, even though it could be extremely lucrative.